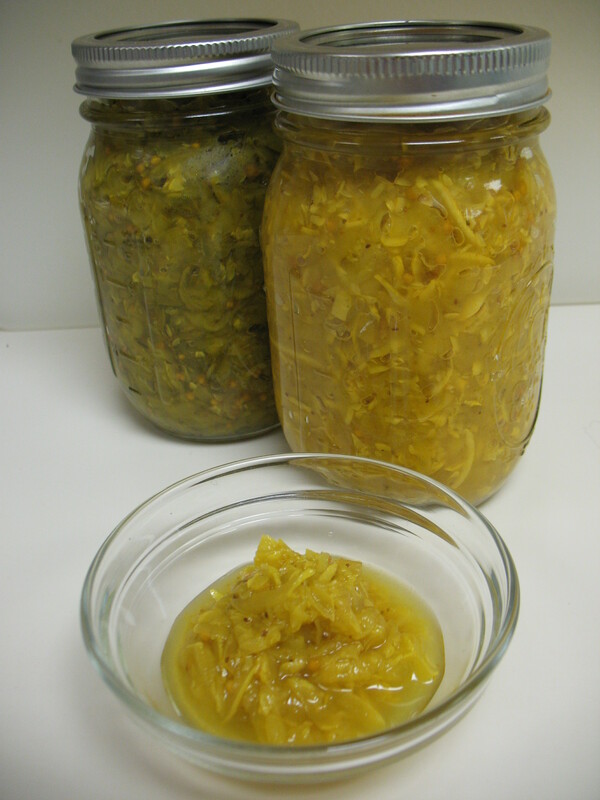 We’re excited to now have a recipe for Summer Squash Relish on the National Center website. You may recall our post about Squash Pickles which are a take on a classic dilled pickle product, flavored with dill seed, garlic, and vinegar. In contrast, the Summer Squash Relish produces a more sweet and tangy flavor, highlighted by cider vinegar, sugar, and turmeric (as well as celery and mustard seed). Once those yellow squash and zucchinis start to come in, they tend to be prolific, so it’s nice to have something to do with them in addition to crudité, stir-fry, and more zucchini bread than even your neighbor’s neighbors know what to do with. This relish goes great on hot dogs and hamburgers, or it may be used to add delicious interest to sautéed greens, potato salad, and other prepared dishes. This Summer Squash Recipe can be made with yellow squash, zucchini, or a combination of both. We especially liked combining about ¾ yellow squash with ¼ zucchini. It is NOT for use with other types of squash such as winter squashes. Directions say to shred the squash in a food processor, but this step may be done by hand instead. Also, we used Vidalia onions in recipe development, but you could use any variety of onion per your own personal preference. Another subtle option that you may choose is to substitute celery salt in place of celery seed if you prefer that taste. This entry was posted in Canning, Pickling, Recipes, Seasonal Food Tips and tagged Squash Pickles, squash relish, summer squash relish, zucchini pickles, zucchini relish on July 29, 2015 by nchfp. This recipe is easy and tastes great. The only challenge I had was figuring out how much zucchini was four pounds (I don’t normally know how much the veggies from my garden weigh). I’m guessing the ratio between onions and zucchini if about 1:4. Unfortunately, that guess is not accurate. The ingredients list contains 4 pounds of summer squash as purchased to 2.4 ounces of prepared onion (1/2 cup). It is not 1 pound onion and 4 pounds squash. The acid levels may not be sufficient for boiling water canning if you use that much more onion than in the tested recipe. Since zucchini and onions are naturally low-acid vegetables, there is a risk of botulism if the food pieces are not properly acidified; altering ratios of ingredients in acidified foods may result in a product that is not properly acidified. There is a great deal of variability in the size of summer squash, and there would also be some degree of variability in the number of cups depending on if the zucchini was diced by hand or shredded. So, the most standardized measurement is the weight. Canning recipes depend on standardized measurements in order to produce a reliably safe and high-quality final product. Many of our recipes do use volume measurements, but there is sufficient acidification to withstand some slight normal variation. I wish they all could be re-formulated to switch to weight measurements but that is not possible at this time. With this recipe, we chose to offer the weight of the prepared onion as well as the volume for those who are using weight, which we could do since we developed it ourselves and did all the measurements and averaging. I’m sorry that this is not always the most convenient approach, but we think it’s worth it for your health and satisfaction. In order to be able to accurately follow tested, trusted canning recommendations of all types, consider purchasing or borrowing a kitchen scale for recipes that call for a particular weight in the ingredient list.